NASA image courtesy Jeff Schmaltz, LANCE MODIS Rapid Response. 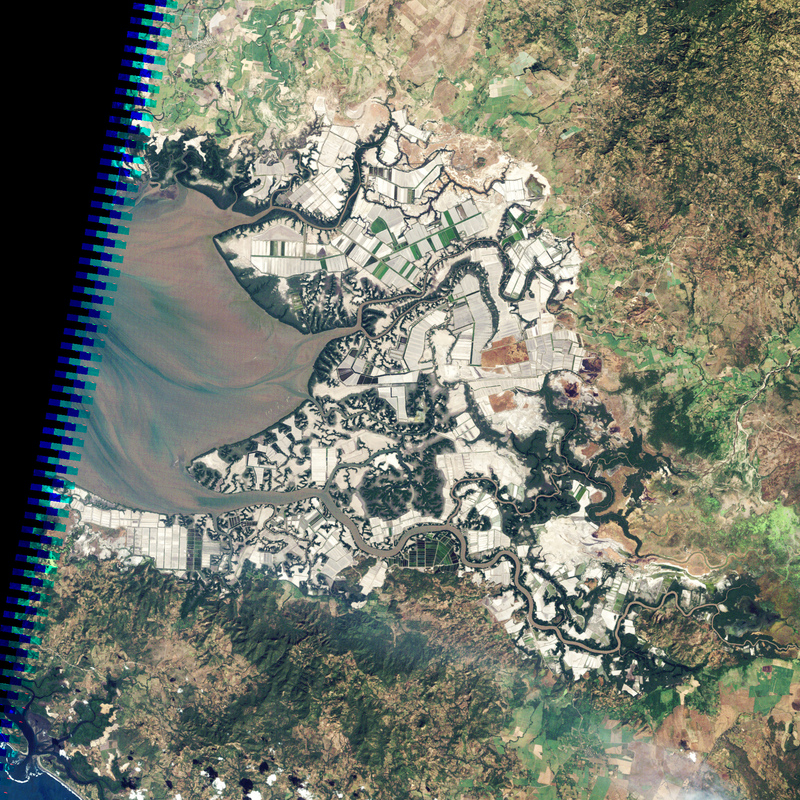 This image was acquired on July 11, 2012, by the Aqua satellite. 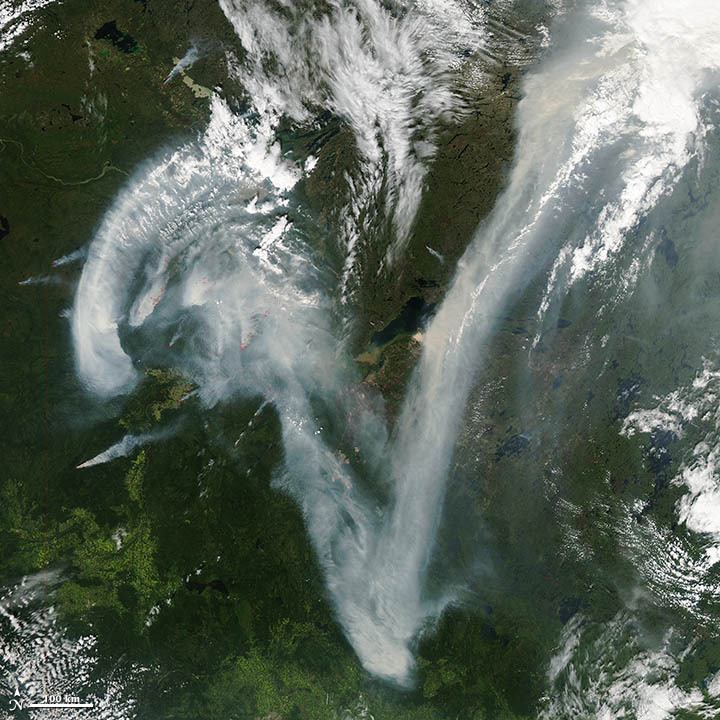 One of the first things that caught my eye when I started checking for interesting satellite imagery yesterday was this: an enormous “V” of smoke draped over northern Canada, as seen by the MODIS instrument on the Aqua satellite. 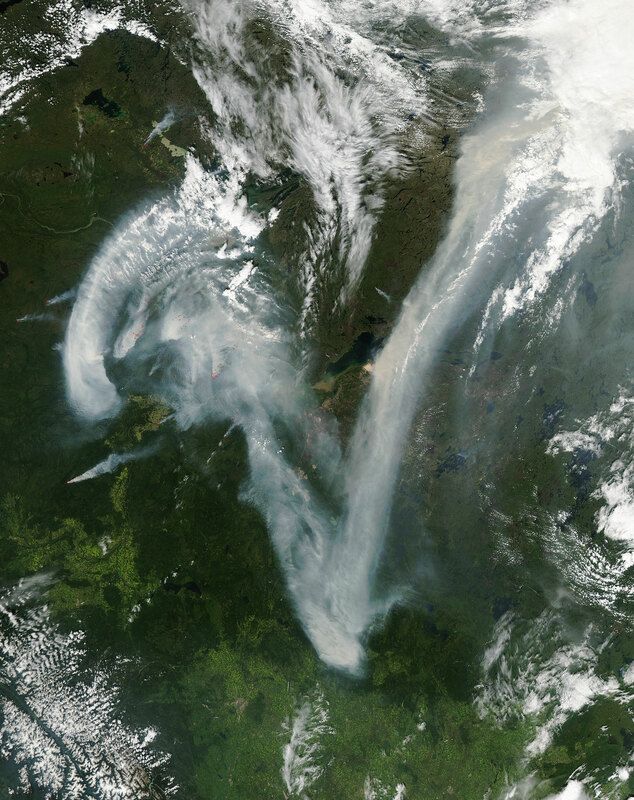 The plume was caused by numerous wildfires burning in the Caribou Mountains of northern Alberta. Still, it’s a memorable image. And it made me wonder: how many other letters have satellites captured momentarily gracing Earth’s atmosphere and oceans? This is the first that I’ve noticed, but I have no doubt there are many more to find given the ceaseless mixing and swirling of clouds, smoke, dust, ice, and even phytoplankton that constantly occurs across our planet. I think it would be fun to compile a gallery of them, so if you’ve seen a letter (or other typographical mark) in a satellite image, please let me know. Just leave a comment on the thread below. Send a link to what you’ve found, and explain what letter or other typographical mark you think you see. If you’re feeling especially ambitious, mention what typeface it reminds you of as well. I’ll update this post as new letters come in, and perhaps we’ll eventually have the whole alphabet (plus a good collection of numbers and symbols). Sending non-English characters is ok: just note what the character is and what it’s called. Please note: Our gallery won’t likely include many of the high-resolution commercial satellite images that you may have seen on Google Earth because we cannot reproduce those images on our website without buying them. 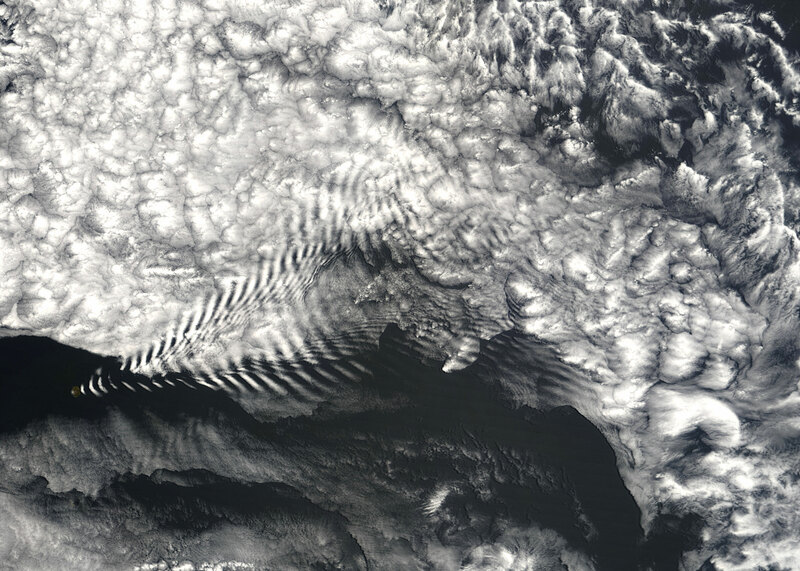 Besides, medium-resolution and low-resolution satellite instruments are actually better for observing large features such as clouds and smoke plumes. Here’s a list of some of the high-resolution instruments that we’ll only be using sparingly, if at all. This entry was posted on Friday, July 13th, 2012 at 12:34 pm and is filed under Satellite ABCs, Uncategorized. You can follow any responses to this entry through the RSS 2.0 feed. Both comments and pings are currently closed. Come on guys, this is a “2” !! And just where do I get photos? Craig, just out the links at the end of our blog post. There are other sources out there, but those are good places to get started. There is an “O” at 51degrees, 22 minutes, 30 seconds North, 68 degrees, 40 minutes 22 seconds West. This was formed by a meteorite impact. Peter, can you include a link to an image you have in mind? Ron, can you include a link? Anna, the letters don’t have to literally be in the sky. 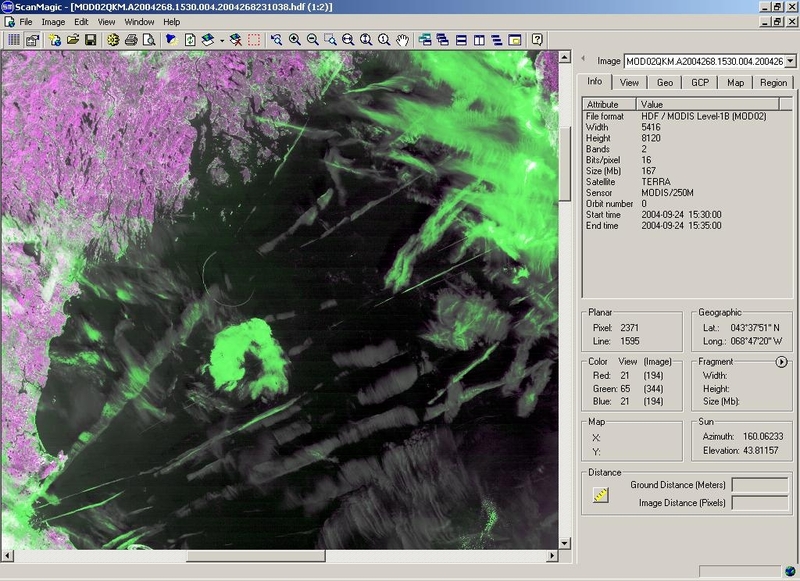 We’re also interested in patterns that show up on the surfaces of oceans, ice, land, etc. The Eye of the Sahara is the best O of all! Or maybe the Eye of the Sahara is a capitol Q? Do you have, or can you start, an email list/newsletter for this? Can’t find a link on the MODIS or Terra site any more. Maybe you have access. Not sure what the difference between this and the one I had found, but I liked the color of mine better. A contrail casting a shadow onto lower level clouds. 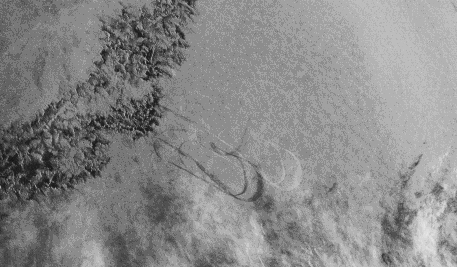 Could be a Q or J or even a cursive G.
From 2011, August 11, 14:30 GMT, Goes 11. 2700 pixels from left edge, 1491 lines from top edge. These old GOES images are avilable here….